Here in the Northern Hemisphere, we are right in the midst of summer. It’s hot and steamy out, and running into the local coffee or smoothie shop to grab an icy cold beverage sounds like a great idea….. until you check the nutritional info for pretty much everything on the menu. Between the sugar-laden simple syrup bases, the sugary flavoring syrups, and the milk, a frappé at pretty much every commercial joint is going to be a carb nightmare. So, what’s a ketonian to do? 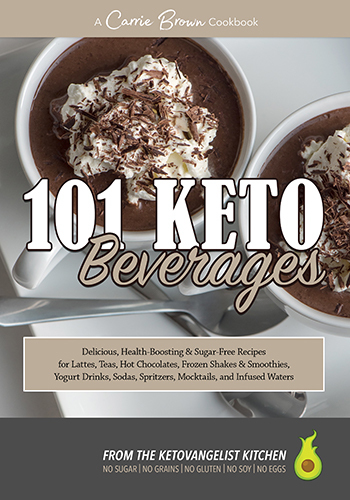 If you happen to be a proud owner of 101 Keto Beverages, by the effervescent Carrie Brown- and I most certainly am- getting your cold frappé fix is as easy as following some simple instructions. If you have access to a blender and some ice, your blended beverage options are only as limited as your spice and extract rack. Being a resident of the extreme Southeastern United States, it’s hecka hot here right now, and having a frappé sounds quite wonderful. So, I chose three recipes to try: Hazelnut Mocha, Gingerbread, and Peanut Butter Cup. As I’ve come to expect from any Carrie Brown recipe, all three drinks were delightful. The Hazelnut Mocha tasted like a frosty glass of Nutella and coffee. The Peanut Butter Cup is a creme frappé (so, no coffee) and tasted like a Reece’s cup. The Gingerbread, which is another coffee based drink, tasted exactly as advertised, and here in sunny Central Florida where it’s 80 degrees in December, it would make a perfect holiday drink when the season comes round again. And speaking of seasonal favorites, Carrie even has a recipe for a Pumpkin Spice frappé. You’re welcome. The best thing about these drinks is how easy they are to make. Considering all the complicated base concoctions, pumps of stuff, and special combination formulas that go into a standard frappé at the coffee shop, the fact that Carrie’s recipes are, quite literally, dump-and-blend is pretty amazing. I measured out my stuff, dumped it all in the blender, and went to town. 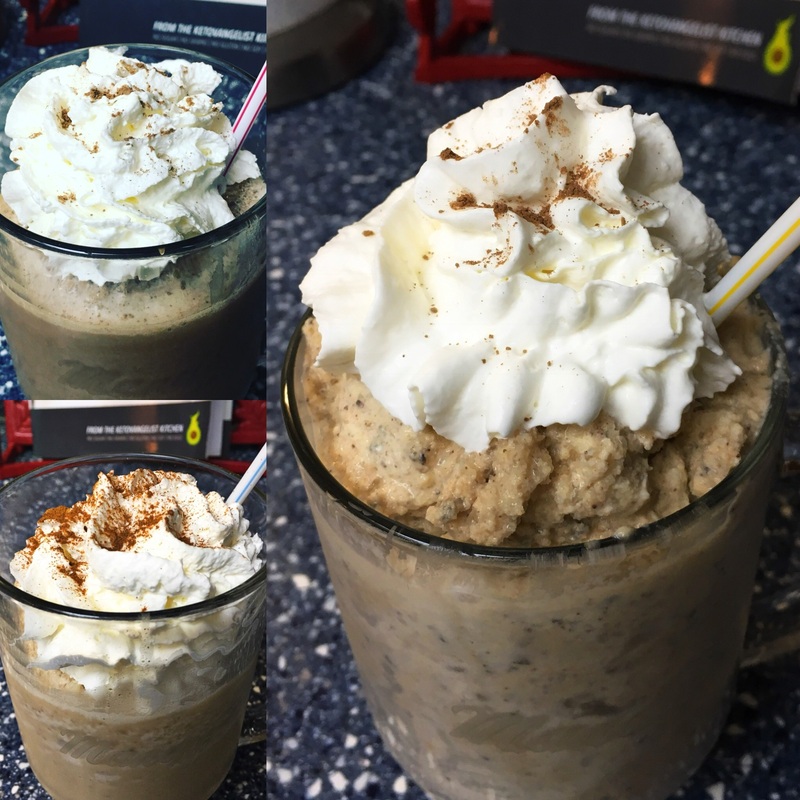 To give these drinks a little extra something, I topped them with whipped heavy cream and a little sprinkle of spices. Violà! A perfect, delicious, and most importantly, cold and creamy frappé was ready to enjoy in a pinch. I spent my time drinking each one of these beauties also fighting off my kids, both of whom insisted on tasting, and then trying to talk me into just handing my beverage over to them to finish. Which most definitely did not happen. That mess was mine! The extra good news about these frappés are that there are quite a few more to be found in 101 Keto Beverages. I focused on coffee and creme drinks, because that’s kind of my taste wheelhouse, but if you happen to like green tea you’re in luck, as there are quite a few green tea based blended concoctions to choose from as well. In fact, that’s probably next on my list of cold drinks to try during this super sweaty summer. 101 Keto Beverages is available for purchase in physical form on Amazon, and as a downloadable ebook on Carrie’s personal website. 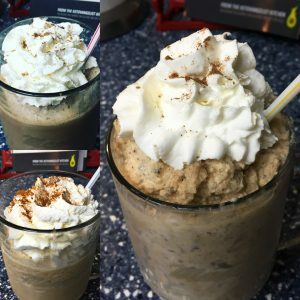 If you loved a good frappé in your pre-keto days, you no longer have to miss out on these chilly treats thanks to Carrie Brown.